How do you pay for an event on the scale of the Olympics? At the best of times, budgeting £7bn is problematic. In a recession it's surely impossible. The Olympics has changed over the last 20 years, partnering increasingly with corporate sponsors. Typically those sponsorships are for cash and are very lucrative but in comparison to the cost of the Olympics as a whole, these amounts are small. The bigger picture is this: one major event with a number of sponsoring brands who bid for advertising rights. There is a clear pecking order among sponsors - the McDonalds' monopoly over chips for example, or BMW's donation of 4,000 (mostly petrol powered) vehicles, or most controversially, the recent story about DOW Chemical's sponsorship of the Olympic Stadium wrap. The conflict is obvious: the Olympics is built on values such as wholesomeness, good health, sustainability, sportsmanship, fairness and openness. With the current Olympic funding model we see those values being sold to brands, who can then wear them like badges - proudly and without having to exercise any of those values themselves. That, at least, is one popular argument. Meredith Alexander was one of 13 Olympic Commissioners asked to make sure the Olympics were as sustainable as possible. Was? She retired over the DOW Chemical sponsorship because DOW owns Union Carbide - the company responsible for the deadly gas leak that killed as many as 300,000 people in Bhopal, according to some sources. And this is really where this article begins. With green custard. On Friday 20th July, three actors performed a 15 minute piece of protest theatre on the theme of 'Greenwashing'. In other words, the Olympics not really being sustainable, or the Olympics not demanding high enough standards from its sponsors. 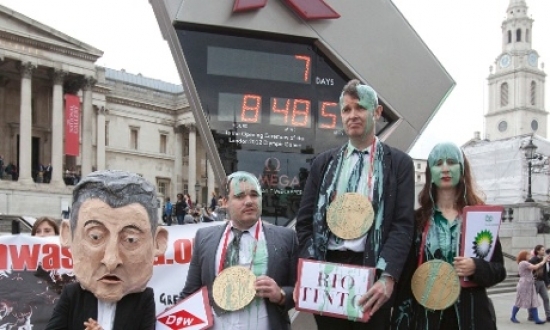 The theatre piece was called Greenwash Gold 2012 Awards, and it concluded with the actors having green custard poured over their heads - very symbolic, as the actors were meant to represent DOW Chemical, BP, and Tinto. 25 police officers descended on the troupe to arrest them for the spillage of a green substance that a Scotland Yard spokesman says was "believed to have been custard," onto the ground. It's not understood (by me) whether the actors were arrested because the policemen decided Trafalgar Square had been besmirched by the green gloop, or if they were simply angry at good custard being wasted. Meredith Alexander said, "DOW, BP and Tinto are spending millions to tell the world how sustainable they are. We did a 15 minute piece of theatre to reveal the truth, and as a result of this piece of theatre 25 police officers turned up and 7 people were arrested. It is an Olympic-sized overreaction." One of the others involved was Kevin Smith, of the London Mining Network. He agreed with Alexander, saying, "It's ridiculously heavy-handed policing." All were all released later on that night, but will have to make a court appearance in September. Until then they have bail conditions excluding them from numerous Olympic venues. Brings new meaning to the informal motto of "The most important thing is not to win but to take part!"